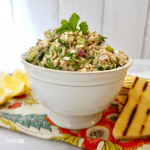 Combine tuna, chopped vegetables, olive oil, lemon juice, and honey. Add salt and pepper to taste, however, I only add about a Tsp or two of salt and it is fine. Mix with your toasted pita right before serving. If you add it too soon it will become soggy!